With my work load increasing since the start of the year, I’ve come to value two words that don’t come easily to me – outsourcing and delegating. Although the outsourcing budget doesn’t stretch as far as I would like (cleaner, anyone?! ), well actually there is no budget, I have been surrendering to the notion that I have to do it all. Usually I would tie myself into knots about trying to map out meals and cook them ahead and then beat myself up if I didn’t get around to doing it before I did the grocery shop. Which is pretty counterproductive. But now I try to take a more relaxed approach. I still try and meal plan ahead and make larger portions on less busier days to freeze, but somedays I just don’t get there and that’s OK. Mr P does the cooking at least two nights a week, which usually involves something easy to heat as he wrangles the two boys as I make my way home on the train. And the other nights quick, tasty and nutritious are the order of the day with the Weber BBQ usually getting a work out. The other week we got to attend a Bloggers family BBQ held by Lenards and as well as having a lovely day in the sunshine, we got to taste and view demonstrations of some of their new products. I was impressed first by the flavours and wide range of products but then even more impressed by the no fuss preparation. Last week the boys and I headed into our local Lenards to get some lovely goodies to try out for ourselves. 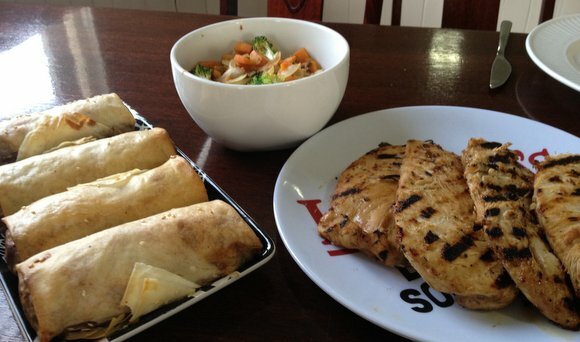 Armed with our generously provided $50 voucher, we managed to get four large chicken oriental spring rolls, four lemongrass & ginger breast steaks, a chargrilled split chicken and a Fajita meal kit for just $3 out of pocket, which seemed like really good value. That night we had the breast steaks with the spring rolls and I quickly stirfried some veges with some garlic, ginger and light soy. Mr P did the chicken breast on the BBQ and being nice and thin, they took less than 10 minutes to cook. The chicken was nice and tender and the flavour was intense without being overbearing. We had some left for wraps the next day and I dare say the flavour was even better. Then on one of my work nights, Mr P wacked on the Fajita kit. The claim for a fresh meal, ready in 15 minutes, complete with fajitas, fitted the bill perfectly. I walked in to a lovely aroma greeting me at the door, followed by the smiles of my boys who were already tucking in. The flavour was fresh and tasty and alot nicer than alot of the store-bought mexican fajita kits I’ve tried before. The chargrilled split chicken is still in the freezer awaiting a lazy weekend BBQ opportunity, which could just be this Sunday. It’s nice to know that when I feel like my quick and easy cooking repertoire is getting a bit stale, and I just don’t have the time to get inventive in the kitchen, that I have alot of fresh and easy options available to cook quickly and within our budget at Lenards. If you’re interested in checking out the product range, click here. *Disclosure: I received a $50 Lenards voucher and invite to the Lenards Bloggers BBQ. The views in this blog are my own. This entry was posted in Food and tagged #lenardsBBQ, easy meals, Lenards chicken. Bookmark the permalink. こんにちは、私が考える私はその| したがって ソー気づいはあなたが私を訪れた私は来ましたに戻る 欲望 私は？しよう 見つける 問題私のサイト！| 高める改善のいくつかのあなたコンセプト ! !